Taking a unique theme and applying it to a traditional slot format, Funky Monkey is a very simple and straightforward three reel, Vegas style game. 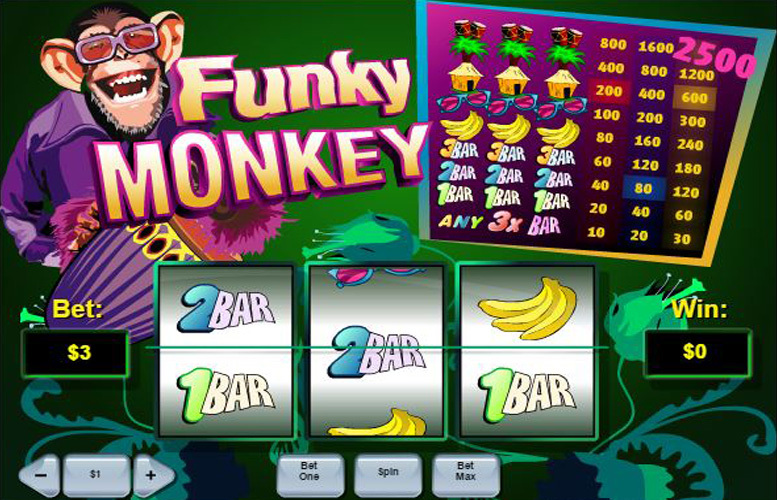 The slot’s reels feature symbols depicting classic bar images, as well as images related to the Funky Monkey that gives the slot its title. Aside from the fun of those images, however, there is little else to boost the gameplay of what is a very simplistic slot. The slot could hardly be easier to understand or to play, and can easily be picked up by a complete slots beginner. A theoretical return to player percentage of 97.10% is one of the highest you will find and means players’ chances of winnings are comparatively good. Funky Monkey includes only a traditional three reel game and does not provide any additional game features, side games or bonus rounds. Payline jackpots are comparatively small but, as the aforementioned return to player percentage suggests, they are also relatively common. Players’ choices when it comes to staking are quite limited, with the overall range of wagers falling between 1p and £15. As a traditional and easy to understand Vegs style slot, Funky Monkey’s payouts are triggered when three matching symbols line up consecutively from left to right across the reels. Which symbols it is that appear, along with the player’s chosen bet level, determines the size of the payout. The most valuable symbol of all is that depicting an image of a pair of bongo drums. If three of those symbols align consecutively across the reels it results in a payout of 800 times, 1,600 times or 2,500 times the chosen coin value. Which of those payouts results depends upon whether the player has chosen to bet one, two or three coins per spin. The highest jackpot, therefore, comes in at £12,500 and is paid out when a player bets three coins at the highest coin value of £5. Funky Monkey somewhat bucks the trend of most modern slot games, in that it doesn’t go in for additional game features. In fact, the game is as straightforward a three reel slot as you’re likely to find, with no special symbols, no side game and no bonus round. As such, if you’re looking for immersive and innovative gameplay, you may be best advised to look elsewhere. As the above should make apparent, all of Funky Monkey’s symbols can be described as regular symbols, in that there are no wilds or scatters on the reels. The symbols fall into two main categories, being those that display traditional bar images and those that display images related to the Funky Monkey himself. It is the second of those types of symbol which are the more valuable, with the palm tree and the hut symbols forming the most beneficial payline combinations behind the bongo drum combination discussed earlier. Three of the palm tree symbols appearing consecutively results in a jackpot worth either 400 times, 800 times or 1,200 times the chosen coin value, dependent on whether the player chooses to bet one, two or three coins respectively. In the same way, three of the hut symbols can trigger a payout worth 200 times, 400 times or 600 times the coin value. Funky Monkey have two decisions to make when it comes to how much they would like to wager on each spin of the slot’s reels. They are whether they wish to bet one, two or three coins on the spin and how much they want those coins to be worth. Available coin values range from 1p to £5 and it should be noted that the payout rates of the game’s symbol combinations are expressed as multiplies of the coin value and not the overall bet. What all of that means is that the minimum possible total bet per spin is just 1p and the maximum possible is £15. Funky Monkey is what might be accurately described as a ‘Marmite’ slot game, in that you’re likely to either love it or to hate it. Which of those camps you find yourself within, will depend upon what it is that you look for from a slot. If you’re a player who likes huge top jackpots or immersive gameplay with loads of extra features, you will certainly not find what you’re looking for with Funky Monkey. The game, after all, relies on smaller and more regular payouts, and has no additional gameplay elements. On the other hand, if you like easy to understand slots which have an impressive overall theoretical return to player percentage, Funky Monkey will be right up your street. This game has a rating of 3 / 5 with 184 total reviews by the users.